Available data from the National Bureau of Statistics indicates a decline in oil and other petroleum production between 2015 and 2016. Crude oil production fell by 16 percent, from 777.5 million barrels in 2015 to 656.8 million barrels in 2016. This is also indicative of the number of exploratory rig count that fell from 15 rigs to 8 rigs in 2016. Similarly, Gas production declined by 10 percent to 2,711 million one thousand standard cubic feet (mscf) in 2016. The significant decline in crude oil and petroleum production, brings to perspective the extent of the damage caused on production pipelines by militants in the Niger Delta region in 2016. It is therefore important to invest national resources in maintaining domestic peace and security, especially in resource-rich regions of the country. The Nigeria Stock Exchange market advanced further as equity indices pitched higher in the review week. Benchmark indices, All-share Index and Market Capitalization rose by 1.5 percent to settle at remarkable points, 37,425 and N12.90 trillion respectively an exceptional first-time record in more than two years. The uptrend has been sustained by stronger demand for investment securities due to outstanding H1 performance reports submitted by some listed companies during the week10. The falling tide in the international value of Naira experienced a reversal in the review week with naira appreciating significantly by 11 percent from N516/$ on February 17, 2017 to N460/$ on February 24, 2017 at the parallel market the first appreciation since December 2016. The recent rise in naira value was driven by forex supply-demand gap closure, sequel to improvements in dollar liquidity. The recent CBN Special intervention (e.g. the auction and sale of $370 million and $1.5 million respectively, by the apex bank during the week) and its revised forex policy guidelinescontributed in dousing speculations in the parallel market, thus gradually narrowing the margin between the interbank and parallel market rates. Given that the sustainability of naira appreciation is strongly hinged on the improvement in foreign reserve which is largely dependent on crude oil sales, the government should continue its efforts at calming tensions in the Niger Delta region. OPEC weekly basket price decreased marginally from $45.95 on June 24, 2016 to $45.26 on July 1, 2016,while Nigerias bonny light fell by $1, from $48.90 to $47.91. The apparent decline in crude oil price was driven by lingering market demand uncertainty, following the unexpected Brexit referendum. More so, ease in supply disruptions in Nigeria and Canada may have contributed to the downward pressure on prices. Going forward, until there is greater regulatory precision on global oil output levels, prices may likely remain stuck or continue to exhibit a downward trend. 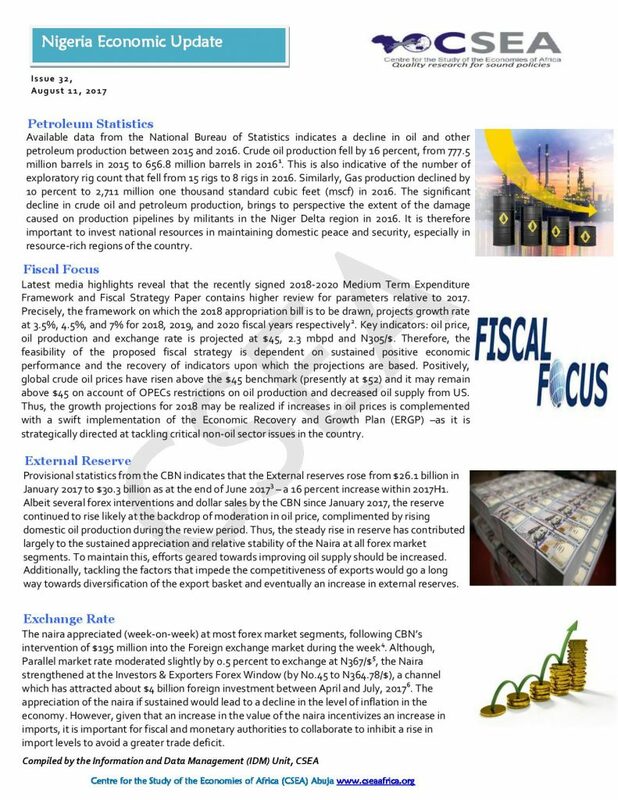 Although, Nigerias fiscal constraints slightly relaxed with oil production increasing in the review week (following repairs on sabotaged pipeline channels), potential global crude oil oversupply threatens governments revenues. However, oversupply threats could be reduced if there is a consensus on oil production quotas in the upcoming OPEC meeting.